Is your sewer or septic line clogged or backing up? Are you ready to rent equipment or call someone to clear it out? Before you do – Call Before You Clear – Know What’s Inside. Throughout the nation, utilities are joining together to let people know about the possibility that some underground natural gas pipes have been inadvertently installed through sewer or septic pipes – a situation commonly known as a “cross bore”. 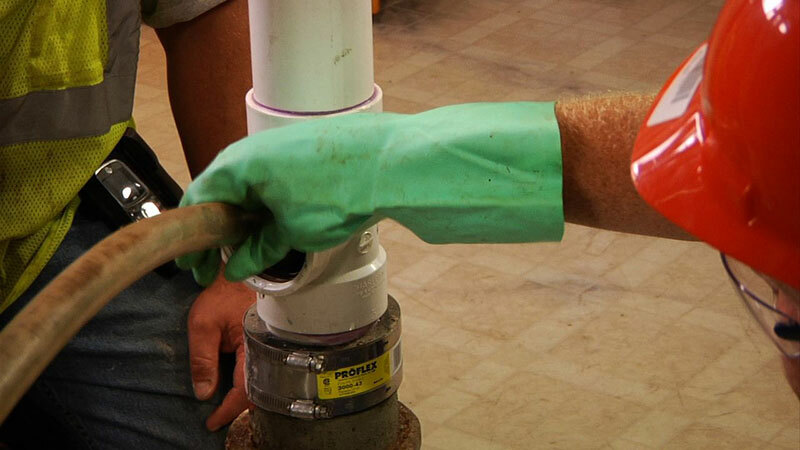 Cross bores can be dangerous because the mechanical equipment used to unclog sewer and septic pipes can easily penetrate a natural gas pipe and lead to the dangerous release of natural gas. So before you attempt to clear a sewer or septic pipe, or have it cleared by someone else, contact the natural gas utility serving the area to ensure there are no conflicts with underground natural gas pipes. Don’t assume you know what’s inside. Protect yourself and those around you – Call Before You Clear – Know What’s Inside. If your sewer is backed up or slow to drain, your first call should be to the natural gas utility serving the area. Why? There is a possibility that a natural gas pipe could have been inadvertently installed through your sewer pipe and the mechanical equipment used to unclog sewer pipes can penetrate the natural gas pipe and lead to the dangerous release of natural gas. As long as a natural gas pipe is not penetrated, it poses no safety hazard. However, if you are having troubles with your sewer, or think you have a blockage, please call the natural gas utility serving the area first before anyone attempts to clear the sewer pipe. 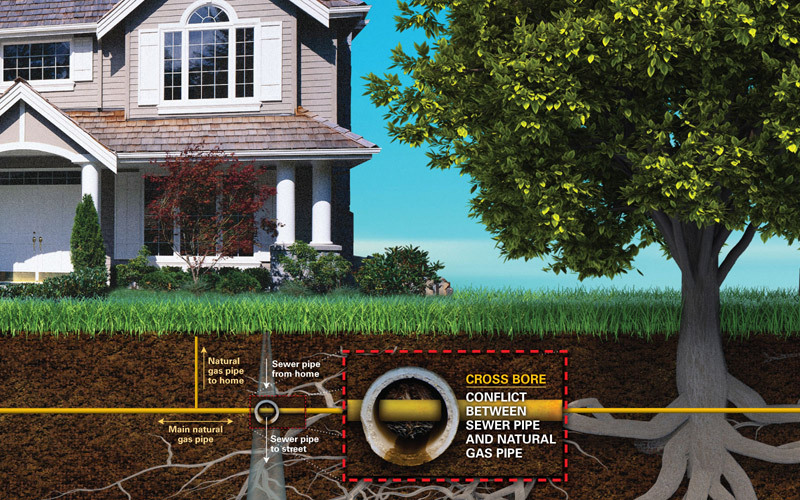 Many utilities use underground “horizontal directional digging” to install natural gas pipes underground beneath streets, driveways, and mature trees to minimize damage. This approach is commonly used in the industry because it involves significantly less environmental impacts and disruption than open trench digging. However, because many vintage sewer and septic lines are made of clay and contain no tracer wire they are not “locatable” (where they can be identified with above ground locating devices) and a utility may have come in contact with it without knowing. What should I do if I have a sewer or septic clog? What if an in-line camera inspection is needed? Participating utilities work with professionally trained sewer and septic camera contractors who can be sent to your location to complete an inspection. 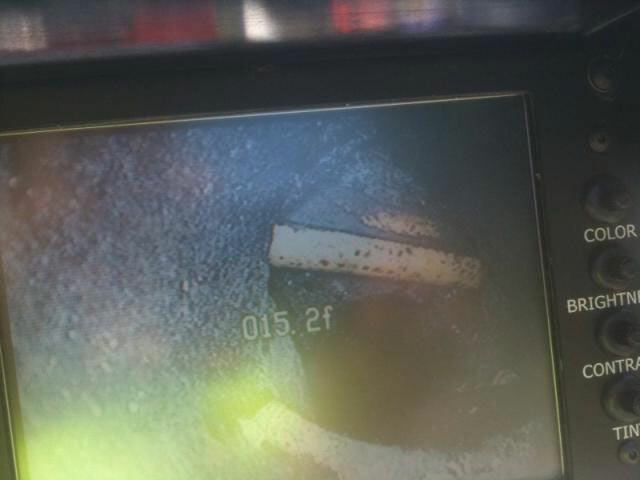 The contractor uses a special camera that goes inside the sewer or septic pipe to identify any conflicts or “cross bores” with underground natural gas lines. There is no charge for this service. How soon ahead should I call? How would I know if a natural gas pipe was penetrated while cleaning a sewer or septic pipe? ➔ A natural gas odor at the cleanout or inside the building served by the sewer or septic line. ➔ Bubbles rising through standing water or in the toilet bowl. What if I sense or see, but do not penetrate, a natural gas pipe? This illustration shows the approximate location for underground utilities. The actual depth of underground utilities varies by location. 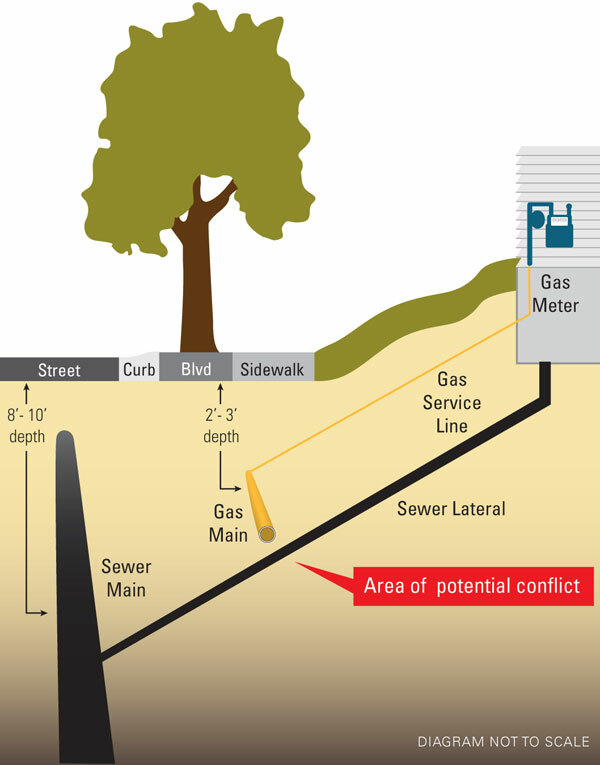 In this illustration you can see how a natural gas pipe could come into conflict with a sewer/septic pipe. If an in-line camera inspection is necessary, a trained contractor will insert a specially designed camera into the sewer or septic pipe. The camera is typically inserted through a sewer or septic pipe in the basement or a toilet. The sewer/septic camera contractor is able to view and track the movement of the camera in the sewer or septic pipe using a monitor. 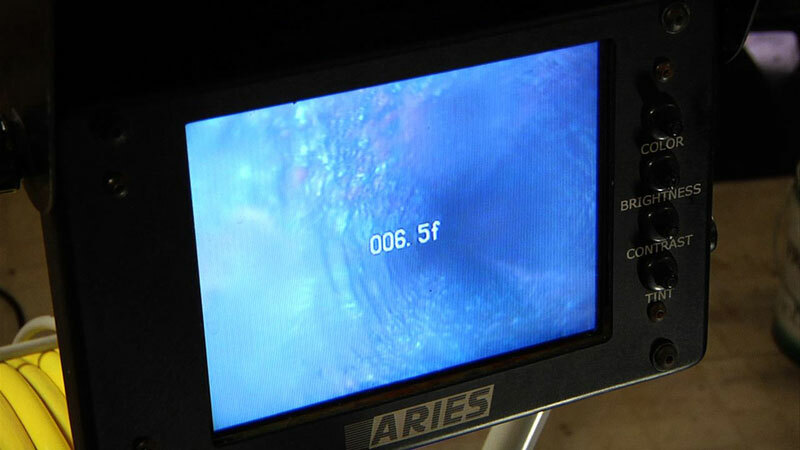 The camera monitor displays in full color any cross bores between a natural gas pipe and sewer or septic pipe. Using this information, the drain cleaner, plumber or home owner should immediately contact the natural gas utility serving the area to notify them of the cross bore and not attempt to clear. 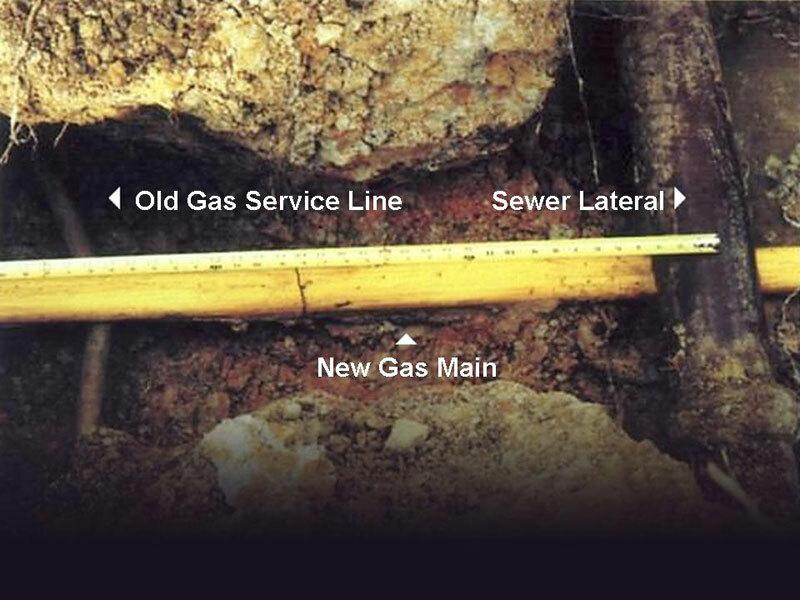 Underground conflicts, or cross bores, between natural gas pipes and sewer or septic pipes have been documented throughout the country. This is where the problem area can occur. 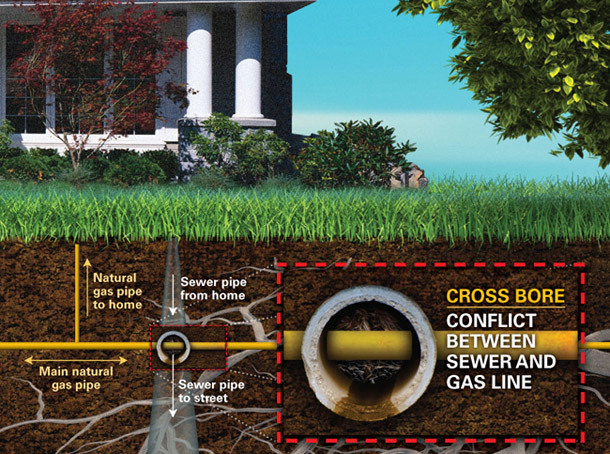 This illustration shows an example of where a conflict, or cross bore, can occur between a natural gas and sewer or septic pipe.